Firefighters reported significant progress along the edge of the Holy Fire Saturday, controlling the spread of the fire and protecting homes, but braced for high temperatures and low humidity throughout the weekend. The fire had burned 21,473 acres and was 36 percent contained as of Saturday evening, fire officials said. 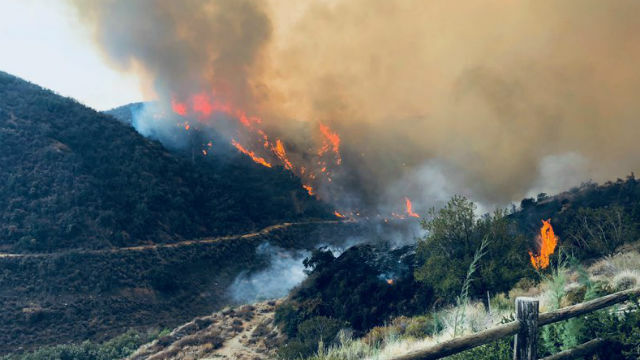 More than 1,500 firefighters battled the fire, which continued to spread to the east toward Lake Elsinore and north into Cold Water Canyon and Santiago Peak, prompting the evacuation of more than 7,400 homes and structures and 21,484 people, according to the U.S. Forest Service. The number of evacuations of homes and structures has been reduced to about 2,700 as of 6 p.m., according to the Riverside County Sheriff’s Department. The South Coast Air Quality Management District issued a smoke advisory for portions of Orange, Riverside and San Bernardino counties. It remained in effect through early Sunday and possibly longer. The Orange County Fire Authority has sent over 100 personnel into the fire fight and includes two water-droppping helicopters, two bulldozers, 11 engines, five patrols and numerous hand crews to aid the firefighting effort, officials said Saturday. Meanwhile, the man accused of starting the fire remained jailed awaiting a rescheduled arraignment next week. Forrest Gordon Clark, 51, made an animated appearance in a Santa Ana courtroom Friday. He labeled the arson charges against him a “lie” and insisted he was being threatened. When a court commissioner ordered his bail to remain at $1 million, Clark said he can easily afford it and asked if he could pay it right away. His arraignment was delayed until Aug. 17. Clark, who refused to come out of his cell to appear in court Thursday, was charged with aggravated arson damaging at least five inhabited structures, arson of inhabited property, arson of forest and criminal threats, all felonies, as well as two misdemeanor counts of resisting arrest. He could face 10 years to life in prison. He also faces sentencing enhancements for arson of multiple structures. The steep terrain was making it difficult for fire engines to get to some of the flames, so the major weapons against the blaze are the aerial water drops, officials said. More than 30 aircraft were utilized Friday and pilots continued making daring low-level drops of water and fire retardant. Mandatory evacuation orders were issued in Riverside County for McVicker Canyon, Rice Canyon, Horsethief Canyon, Glen Eden, El Cariso Village, Sycamore Creek and Rancho Capistrano, along with the Ortega (74) Highway corridor from the Lookout restaurant to the Nichols Institute. By Saturday morning, however, evacuations were lifted for the Horsethief, McVicker and Rice areas, with Mountain Street at Avocado Way closed at pavement in Lake Elsinore. For specific information regarding closures, residents can contact the Cleveland National Forest’s fire information line at (714) 628-7085. Trabuco and Holy Jim canyons remain under mandatory evacuation orders, as well as the Blue Jay and El Cariso campgrounds. All campgrounds in the Trabuco Ranger District were closed and forest road closures were in effect for Trabuco Creek, Maple Springs, North Main Divide, Bedford and Indian Truck Trail. Gov. Jerry Brown declared a state of emergency for Orange and Riverside counties Thursday due to the effects of the Holy Fire, allowing the state Office of Emergency Services to provide assistance to the counties. Two firefighters were treated for heat-related injuries Monday. Two other firefighters were reportedly injured Thursday while fighting the blaze near Lake Elsinore and Horsethief Canyon. Since it erupted Monday afternoon, the blaze has destroyed a dozen cabins in the Holy Jim Canyon area of the Cleveland National Forest and advanced into Riverside County. As of Friday morning the number of destroyed structures officially remained at 12, although television footage appeared to show a home burning to the ground in the Lake Elsinore area Thursday night. The fire was initially reported at 1:15 p.m. Monday near Holy Jim Canyon and Trabuco Creek roads, Orange County Fire Authority Capt. Tony Bommarito said. The fire dramatically increased in size near the Horsethief Canyon area on Wednesday, then jumped the North Main Divide dirt road, burning into the Lake Elsinore area of Riverside County, Bommarito said.